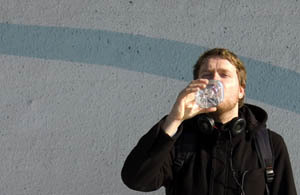 Palac is Peter Prautzsch, living and working as designer and media artist in Berlin. He creates works as either Peter Prautzsch (soundart / video) or Palac (electronica / dj), runs his netlabel Palacmusic as well as the netproject Frozen Elephants Music. His music is defined by swarming electronic glitch, pastoral strings, crisp digital cuts and shudders of other, barely recognizable things. His 2007 album release has recently been nominated for the Quartz Music Awards 2009. For the Club Transmediale 2009 performance he will team up with Neo Ouija Labelhead Martin Hirsch (aka Deer).